If you’ve spent time in Sedona over the recent years, you’ve realized that in addition to its stunning natural beauty, Sedona is making its mark as one of Arizona’s culinary destinations. Award-winning chef and restaurateur Lisa Dahl is a large part of this town’s thriving dining community and on our frequent trips up north, you’re sure to find me at one of her four restaurants, such as Mariposa Latin Inspired Grill (read about my first visit here), Pisa Lisa, Cucina Rustica, and Dahl & Di Luca (pictures here, here, and here). While Dahl & Di Luca is worthy of a visit at any time, to celebrate 23 years of success, Chef Dahl has created a special four-course, prix-fixe Romanticismo Decadente menu available through November 30 which my husband and I were recently invited to experience. 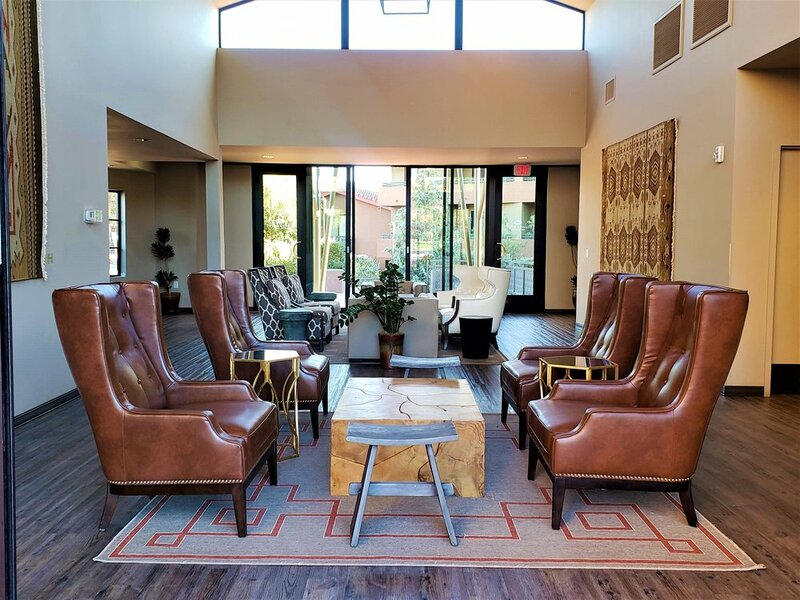 After a scenic drive to Sedona (with stops at the Southwest Wine Center, Chateau Tumbleweed, and Merkin Osteria), we checked into Sedona Rouge Hotel and Spa and relaxed before making the convenient one-minute drive to Dahl & Di Luca. It was easy to see that Dahl & Di Luca is still beloved by both visitors and locals, and I was happy we had a reservation. Even on a Tuesday night, every table in the dining room was full with happy guests enjoying the sounds of a pianist on the restaurant’s Baby Grand Piano. It was the perfect ambiance to enjoy the special menu, which included an aperitivo of sparkling prosecco. We began with antipasti of Caprese d’Amore stacked with a marinated and grilled portabello mushroom, juicy tomatoes, mozzarella and fresh basil, and a pair of crispy-cheesy arancini stuffed with mozzarella and peas and nestled in a zesty pomodoro sauce. Our next course featured a primi of Ravioli Romana - tender pockets of pasta encasing a creamy four-cheese filling and draped in a rich mushroom and truffle cream sauce. For a seafood-lover like me, the entree option of Prawns Fiorentina (plump shrimp sauteed with lemon, garlic, white wine and spinach) was a natural, and delicious, choice, while my husband opted for one of his favorite Italian classics, Vitello Piccata (veal scallopini in a lemon-caper sauce), both served with buttery orzo pilaf and the vegetable of the day. Creamy panna cotta infused with lemon, lavender, and Tahitian vanilla beans accompanied by a sweet huckleberry emulsion and a cup of cappucino was the perfect finale. “This limited-edition Romanticismo Decadente menu celebration of our 23rd year,” says Dahl, “takes my favorite classic-Italian recipes and packages them into a magical experience for guests.” Guests can order this special prix-fixe through November 30 for $65 per person. You’all also want to take advantage of their award-winning wine list for optional wine pairings ($35 per person), as we did - Dahl & Di Luca has been recognized with Wine Spectator’s Award of Excellence for 13 consecutive years. Dahl & Di Luca Ristorante Italiano is located at 2321 AZ-89A, Sedona, AZ 86336, and is open seven days a week, 5-9 pm. For reservations, call (928) 282-5219 or visit OpenTable.